You may remember seeing this fabulous and uber trendy Hermes inspired bracelet on my 5 things to love from Belina post earlier this week. Love it, right? Well, Belina is giving one lucky TFD reader their very own Igancia ($22 VALUE)! Stop by ShopBelina.com and tell us your favorite piece from the store. Follow @shopbelina on Twitter and/or Like them on Facebook. All of which must be done by 8/19 @11am. Goodluck. There are so many items I love but I will have to go with the "Edith" bracelet as my favorite item! Well the Ignacia IS my favorite!! My all time fave is the "Amanda" necklace!!!! I LOVE the Agnes ring! I'm not sure I've ever seen a ring so fantastic! I like the "Estrella" starfish ring! I like the Estrella ring. Such a pretty starfish! I follow Shop Belina on twitter! Liked them on FB too! I am in love with the Viviana earrings. So dramatic and cool looking! followed them on twitter too! I like them on FB and follow them on Twitter, I'd LOVE to win this one! 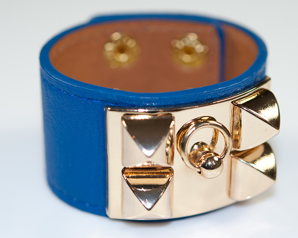 I liked Belina on FB under Zara Willis and I love the Estrella ring. My favorite item is the turquoise evil eye bracelet! I've wanted an evil eye ever since I met my Turkish friend who has them all over her apartment! I've been a fan of Shop Belina on facebook as long as I've known about them via your blog! Following Belina on twitter (@fashfrugality) and facebook (ktkatherine)! The Sonia earrings are very pretty! i love the Alice earrings. and Viviana is my runner up as my 2nd fave! both pair of earrings are so cool and original. Uhhhh you know I want this bracelet, in this color. and I like them on facebook too! I absolutely love the Ignacia, but my other favorite is the Jennifer ring. I like the "AGNES" Ring, hopefully she'll be in stock soon! I'm loving the Zoe Necklace! I think that my favourite item is this Ignacia bracelet! So beautiful!